I had the opportunity to participate as a presenter for an education session at ASCO 2017 (Chicago, IL), the largest oncology meeting in the world. 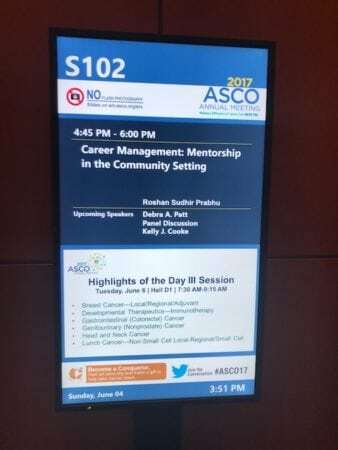 Our session was focused on the ideas of mentorship and how to conduct effective research in the community based setting. The differences between traditional University-based academics and community based medical practices are shrinking, and now a good amount of the research that contributes to practice changing discoveries are being conducted in community based practices. 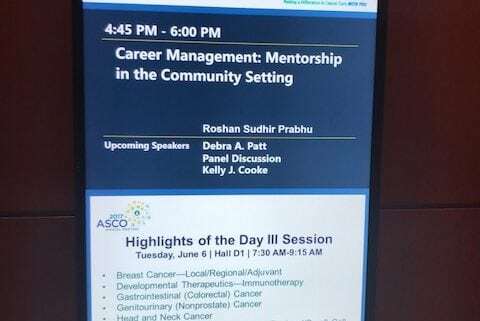 I am fortunate to be the Director of Radiation Research for the Levine Cancer Institute, Carolinas Healthcare System, and I was able to talk about our successes in a variety of research pursuits, from participating in national clinical trials, designing and writing trials that will be conducted across the nation, publishing studies from our own clinical experiences, and performing studies in collaboration with other respected institutions. We aim to provide the best care for our patients, but also actively contribute to the advances that will shape what the best care will be tomorrow.